I am thinking about getting a 43′ vertical to use on 160 to 10 meters. Has anyone calculated the coax loss for 100 feet of RG-213 coax, especially on 80 and 160 meters? 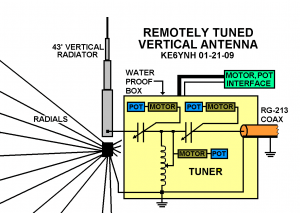 Would it be beneficial to build a remote tuner [like below] and place it at the base of the 43′ antenna to reduce coax loss? A remote tuner is the way to go, but for now I going to use the 4:1 balun and just deal with the losses whatever they may be. For the Virginia QSO Party I hope this will be a major antenna, but won't be the only one so I can take the risk. Your drawing of a remote tuner is beautiful. The devil is in the details, of course, but this classic matcher design should do ok. I am not sure the pot on the motor for the adjustable inductor will do much to help understand multiple turns. You could just adjust it blind for minimum SWR and not worry about absolute values. As we have shown on other posts on this site, the 43 foot antenna is less than ideal for 10, 12, 15 meters… 17 too perhaps. 20 it should do well. 40 and 80 are workable. It should be pretty weak on 160 meters and may challenge your tuner beyond its limits. Worth a try though. Use the chart/formula in the ARRL Antenna Book (in the 22nd edition it's section 23.2.4 Additional Power Loss Due to SWR) to see what the difference is between putting the tuner at the base of the antenna and in the shack. Rough estimate….. using 100' of RG-213 in the 80m band with an SWR as high as 10:1 would only add another 0.8 dB of loss. With shorter coax, 160m band, or a lower SWR to begin with would each make that loss even lower. Even going all the way to the 10m band would still only be about 1.5dB additional loss with a 10:1 SWR. If the antenna was at 4:1 to begin with at 10m it would drop the added loss to only 0.8dB. I think most people don't realize how low the added loss is with coax, especially if your SWR isn't too bad to begin with or if you're using decent coax like you are. There are even lower loss cables out there that would make even less of a difference between having the tuner remote or at the shack. For most people, I think spending the money on lower loss coax instead of a more expensive remote tuner and the control/power cables for it would give results that were close enough to, if not better than, having the tuner mounted at the antenna. In my case, I'm only using about 70' of coax, so the added loss of not putting the tuner at the antenna would only be about 70% of what it would be for the 100' figures given. I think you may be approaching this from the receive-side, only. Considering that a 1dB loss is equivalent to a 20% drop in power, would you find it acceptable to burn 20 watts of transmit power in the feed-line when you only have 100 watts available from your transmitter? A 20% drop in radiated transmitter power is inconsequential.